Learn how Gozio’s indoor navigation and feature-rich platform anchor your mobile strategy and enhance your patients’ overall experience. Accuracy within four feet from any indoor destination gives your patients the confidence of getting to their appointment on time and improves their overall patient experience. Gozio’s content management system is your web-based interface for managing and customizing all cloud content in real time. Gozio’s mobile platform has the benefit of exposing patient to features that assist with their medical care needs. We believe that when hospitals develop one app to rule them all their patients benefit with a convenient, personalized health care experience. Gozio’s wayfinding platform creates a one stop, central hub for patients’ health care needs by integrating with additional applications and portals. Integrations include the ability to schedule appointments, access to virtual visits, medical records, patient education, physician directories and more. Our data shows that over 90% of individuals who download a hospital-branded wayfinding platform developed by Gozio, return to use the app for additional featured integrations. Gozio analytics help you better understand the patterns of your patients and visitors. The dashboard allows you to gain real time feedback and see where patients are getting lost or what app features are most popular. Kiosks assist visitors who don’t have the app installed with 3D hospital maps labeled with points of interest. Kiosks have the same content manager as the mobile app allowing you to update maps, services and amenities in real time. 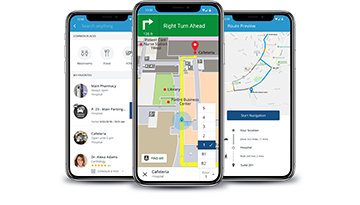 From mapping and installation to data integration and maintenance, Gozio’s indoor navigation platform is a complete, turnkey solution.